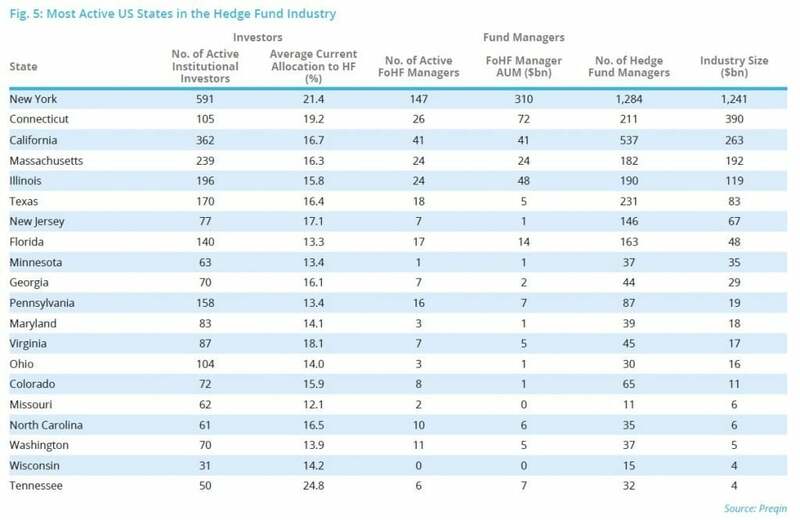 In this extract from Preqin Special Report: Hedge Funds in the US, we rank activity in the US hedge fund industry by state, and examine the make-up of investors and fund managers in the country. The US remains a key driver of the hedge fund industry across the globe, accounting for 72% of the approximate $3.6tn in global assets as at 31 May 2018. Despite hedge fund activity in other regions globally expanding alongside that of the US, the country accounts for 3,405 of the 5,523 institutional investors active in hedge funds and 3,319 of the 5,383 active hedge fund managers tracked by Preqin. All 50 US states are home to at least one institutional investor actively investing in hedge funds, and there are only two states that have no hedge fund managers operating within them. 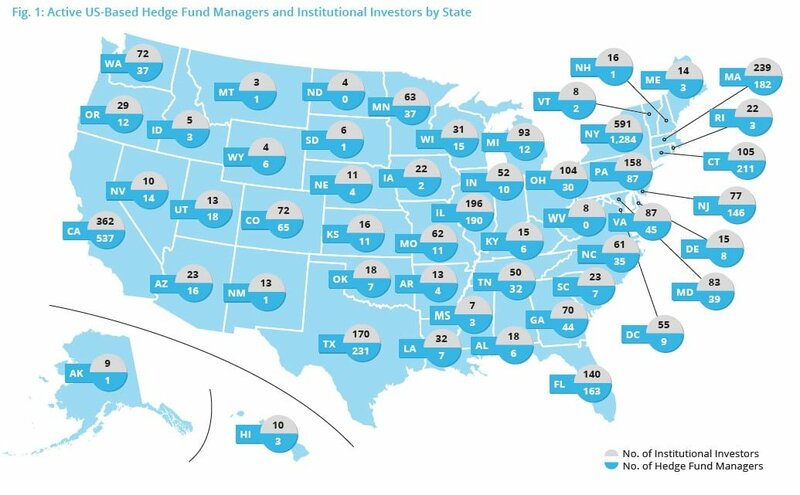 New York accounts for just under half of all US hedge fund industry assets; Connecticut is home to the two largest hedge fund managers in the world. 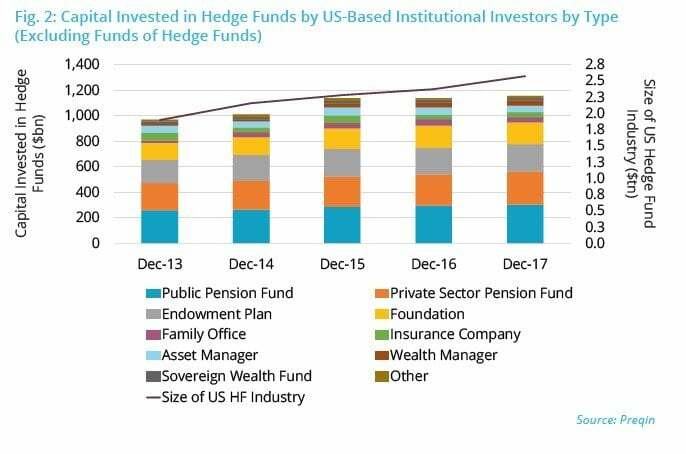 Pension funds are, by some distance, the largest aggregate allocator to hedge funds, contributing almost half of all institutional capital invested in the asset class by US-based institutional investors (Fig. 2). Over half of US-based funds of hedge funds are based in New York (Fig. 3), with the aggregate AUM of fund of funds managers headquartered in the state totalling $310bn. Blackstone Alternative Asset Management is the largest fund of hedge funds manager in the US and, indeed, the world, currently managing $75bn (as at May 2018). Over one-third (36%) of all US-based fund managers are based in New York, while California and Texas are home to 15% and 6% respectively. Single-manager hedge funds account for a significant majority (76%) of US-based hedge funds, with funds of hedge funds, managed futures/CTAs and liquid alternative structures representing 13%, 6% and 3% respectively (Fig. 4). Using data from the Preqin Quarterly Update: Hedge Funds, Q2 2018, we provide the hedge fund performance statistics for Q2 2018. Following a challenging start to 2018, hedge fund performance, on the whole, has gained momentum during Q2 2018. The Preqin All-Strategies Hedge Fund benchmark returned 0.73% over the second quarter (Fig. 1), an improvement on the 0.07% returned in Q1. Alternative mutual funds outperformed all other fund types for the quarter (+1.18%), which marks a considerable turnaround since the beginning of 2018 when they returned -0.81%. Equity strategies were the worst performers in June (-1.00%), despite posting the best returns in April and the second best in May, highlighting volatility in broader equity markets (Fig. 3). CTAs were the only top-level strategy to suffer losses over Q2, albeit to a lesser extent than in Q1. Hedge funds with a focus on North America reported the highest returns (+2.79%) in the quarter (Fig. 4). Hedge funds focusing on emerging markets made losses in Q2, a significant turnaround from Q1, when funds in the region displayed the highest returns. The strong performance towards the end of 2017 and early 2018 appears to be waning in emerging markets, highlighting volatility associated with funds based in the region. In this month's Industry News, we look at the recent strong performance of credit hedge funds and recent credit strategies fund launches in 2018 so far, as well as foundations' investment plans for the coming year. Credit strategies hedge funds have delivered positive returns in every month since March 2016, returning 2.79% for 2018 YTD (as at July). Cedar Ridge Investors Fund I, managed by Connecticut-based Cedar Ridge Partners, was a key driver of the benchmark’s performance, generating 4.77% in June 2018 and bringing its 2018 YTD return to 15.70%. The fund focuses on fixed income and long/short credit strategies in North America. Whitebox Credit Fund LP generated the second highest (+2.79%) return in June 2018, taking the fund’s 2018 YTD return to 5.17%. Managed by Minneapolis-headquartered Whitebox Advisors, the vehicle has generated three- and five-year annualized returns of 5.40% and 6.23% respectively. AcuityOne Hedge Fund has delivered a 2018 YTD return of 8.57% and a three-year annualized return of 11.82%. Managed by Johannesburg-based Acumen Capital, the vehicle employs a relative value fixed income strategy with a sole focus on its domestic region. Since the start of 2018, 105 credit strategies hedge funds have launched and collectively secured an estimated $8.9bn. Among these funds is Glen Point Emerging Markets Debt Fund; managed by London-based Glen Point Capital, the vehicle deploys a fixed income strategy focused on sovereign debt in emerging markets. Launched in January 2018, Mirabaud – Global Diversified Credit Fund is a multiasset credit fund that targets a diversified portfolio of global credit opportunities, while ESG factors are also taken into consideration as part of the portfolio construction process. Allianz Fixed Income Macro Fund launched in July 2018 and primarily focuses on fixed income strategies in the UK market. Foundations target a range of hedge fund strategies across a variety of locations in order to diversify their portfolios (see page 11). UJA Federation of New York, for example, is looking to invest in at least one Asia-Pacific-focused hedge fund in the next 12 months using a mixture of existing and new managers in its portfolio. The New York-based foundation plans to invest with healthcare-specialist hedge fund managers, but is also open to opportunities in other industries. Mississippi-headquartered Trinity Health plans to invest in 2-3 hedge funds across a variety of strategies including multistrategy, long/short equity, value-oriented and relative value arbitrage on a global scale. Compagnia di San Paolo expects to invest in hedge funds in the next 12 months; the Italy-based institutional investor has previously shown a preference for funds of hedge funds with a global reach. 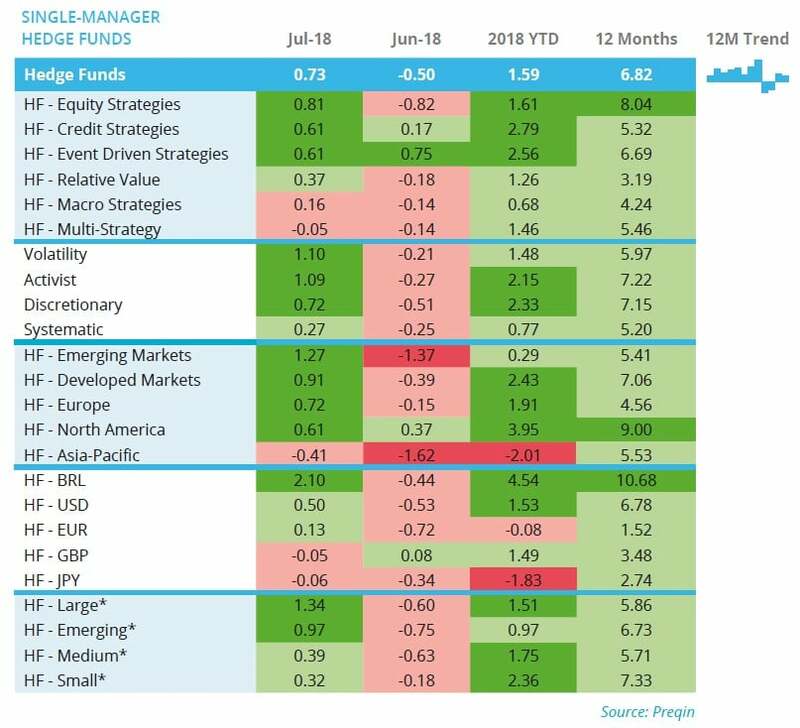 The Preqin All-Strategies Hedge Fund benchmark returned 0.73% in July 2018 following underperformance in June (-0.50%). This takes the year-to-date return to 1.59%, pushing the 12-month return to 6.82%. Equity strategies outperformed all other top-level strategies for the first time since January 2018 with gains of 0.81% in July, bringing the year-to-date return for the strategy to 1.61%. Multi-strategy was the only top-level strategy benchmark to suffer losses (-0.05%) in July. 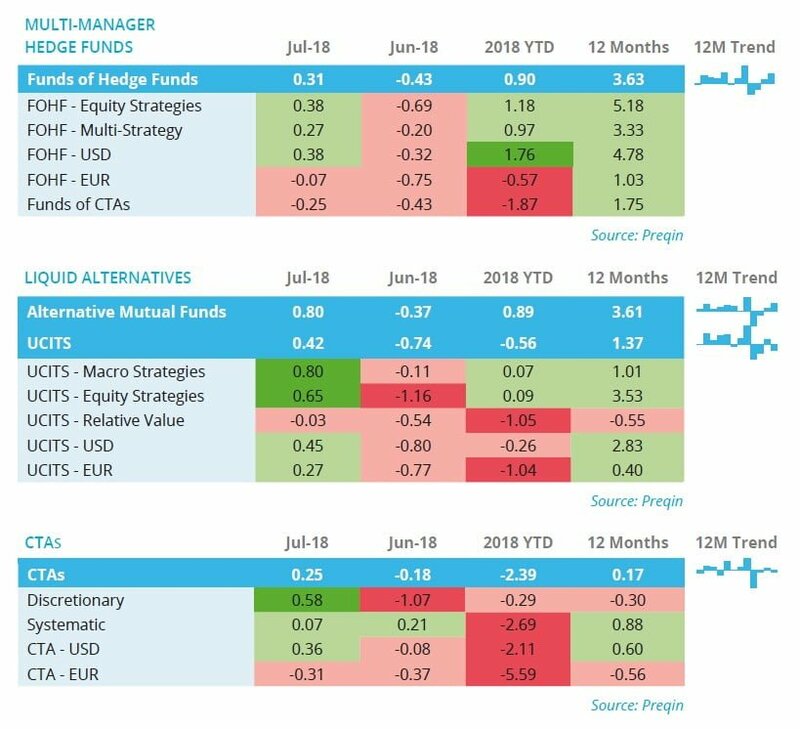 Hedge funds focused on Europe (+0.72%) performed slightly better than those focused on North America (+0.61%), bringing the benchmark’s 2018 YTD return to 1.91% and its 12-month return to 4.56%. Here, we examine the geographic and strategy preferences of foundations investing in hedge funds, their preferred route to market and average allocation to the asset class. 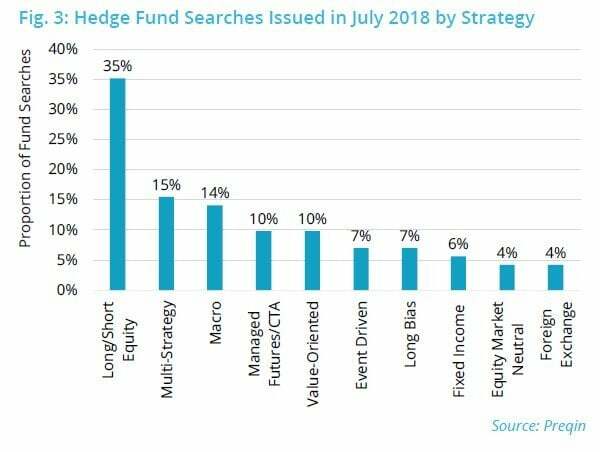 We take a look at the hedge fund searches issued by investors on Preqin's online platform in July 2018, breaking them down by investor location and type, and also provide sample fund searches.